Those who embrace digital technologies will be writing history. Early this year, UI Labs launched an educational series focused on harnessing data to make American factories more efficient and competitive. (Lofty goal, huh?) The massive open online course (MOOC) curriculum includes 40 hours of instruction, assessments, peer interactions and a final project. Developed for both students and workers, the series introduces a broad range of digital manufacturing and design technologies, and demonstrates how they can be used throughout a product’s lifecycle. Thomas McDermott, executive director of Digital Manufacturing & Design Innovation Institute (DMDII) and chief program officer of UI LABS; Timothy Leyh, executive director of the University at Buffalo Center for Industrial Effectiveness; and Bob Fornasiero, partner and machinist at Hudson Design & Manufacturing. Smart Industry: Describe your role with this initiative. McDermott: The Digital Manufacturing and Design Innovation Institute (DMDII), a UI LABS collaboration, brings together partners from universities and industry, along with government and startups, to address manufacturing challenges and make the U.S. more competitive using digital-manufacturing technology. In an effort to introduce digital-manufacturing concepts to a wide group of people, we forged a partnership with Coursera to co-develop a competitive application. We began soliciting proposals in December 2015 to develop the country’s first online course series in digital manufacturing and design. Dozens of manufacturing executives, educators, and non-profit leaders participated in a workshop to develop proposals for the series. Leyh: Our center led the University at Buffalo’s response to answering DMDII’s call for the creation of these online courses. As an outreach center of UB’s School of Engineering and Applied Sciences that assists industry and places emphasis on educating the workforce, we have established a footprint in the manufacturing community and also leverage strong relationships within the university to regularly tap faculty and staff expertise. Our role with this initiative includes strategically forming the project team from our repertoire of resources, conceiving an academia-industry approach to developing courses, and managing content development and production. Smart Industry: Why launch this initiative now? McDermott: Investing in theU.S. manufacturing workforce has never been a more pressing imperative. DMDII and Coursera’s mutual goal is to provide citizens with high-quality, low-cost, and industry-relevant content to help them thrive in the new manufacturing environment; we also want to create a talent pipeline that contributes to innovation, productivity and competition. Online learning presents opportunities for on-the-job training and enables motivated workers to access content on their schedules. Many of our partners already use the availability of course content to address anything from technical areas to organization-management needs. Leyh: The National Institute of Standards and Technology (NIST) forecasts that by 2020, there will be more than 600,000 U.S. job openings in the advanced-manufacturing sector. Over the past 20 to 30 years, manufacturing jobs in our country have been lost to offshoring, coupled with a generation that has been steered away from pursuing a career in the industry. As more nationwide efforts are pumped into creating a manufacturing resurgence, and with the reshoring that has begun, the need to educate the current and future workforce about the opportunities in advanced manufacturing (Industry 4.0) using an online-learning platform is paramount. Smart Industry: Who do you envision getting the most benefit out of this program? McDermott: We hope the “Digital Manufacturing & Design Technology” course specialization—Coursera’s term for a series of related courses designed to help learners master a specific topic—exposes a wide range of learners to the concepts of digital manufacturing. The program is designed to be accessed anywhere—all that’s needed is an internet connection. We believe the courses will be useful to someone just hearing about digital manufacturing, as well as to people who have built their careers working with machines on factory floors. The goal of the specialization is to provide a tool for learners to market their new knowledge. Coursera has made considerable progress working with corporate and business partners throughout the world to recognize the accomplishment of completing a specialization. Leyh: We have structured this program to appeal to three distinct populations: high school graduates exploring career interests, factory workers who want to understand how their jobs may change with the advent of new technologies, and small- to medium-sized business owners looking to adopt digital manufacturing and design (DM&D) technologies. Smart Industry: What are the main themes in the instruction provided? Leyh: Instruction provides a basic understanding of DM&D and the use of data throughout manufacturing, known as the digital thread. Courses align with the concepts and platforms that are central to DMDII’s mission. Smart Industry: What technologies will be explored/demonstrated? Leyh: The Digital Manufacturing Commons open-source platform, additive manufacturing, PLC, artificial intelligence, robotics, intelligent machining, product-lifecycle-management software, CNC controls, sensor technology for machine tools, CAD/CAM/CAE solutions, virtualization, data storage, server system and networks, SysML, cloud computing, manufacturing execution system, MRP/ERP, information security framework, and RFID tags. Smart Industry: What does completion of this course / certification enable a participant to do? Leyh: Participants will be exposed to numerous concepts and capabilities related to DM&D and where manufacturing is heading in this evolution, known as the “Fourth Revolution.” They will be given a sense of how data is becoming more integral across all stages of the product lifecycle, and how this information-sharing through the digital thread is enabling smarter decisions that result in efficiencies, faster product launches, and increased competitiveness. At completion, participants will use an e-portfolio tool to create a roadmap for achieving their own personal goals related to the DM&D profession. McDermott: Courserahas established itself as a highly reputable source for online educational content.Research from Coursera shows that of the learners who cited career goals as the primary motivation for enrolling in a MOOC, 85 percent reported qualitative gains, like developing skills or improving their job prospects. One-third saw a “tangible” benefit—like a new job or raise. We believe this specialization has the potential to benefit learners who use the credential in the workplace, and that the material will spark interest among students and recent graduates to further explore opportunities in advanced manufacturing. Smart Industry: What is the benefit of bringing universities and factories closer together? McDermott: With more than 300 partners from around the country—spanning large OEMS to SMEs, non-profits and leading academic research institutions—DMDII was founded on the idea that tackling problems in manufacturing requires forging new alliances to break down barriers. The Digital Manufacturing & Design Technology specialization, featuring 40 hours of content and learning on a complex subject, exemplifies what can result from a collaborative approach to innovation. The University at Buffalo led a group to develop the curriculum that included Siemens PLM, SME, the Association for Manufacturing Technology, Moog Inc., and Buffalo Manufacturing Works. By combining its expertise with those of its partners, UB developed a practical curriculum that will help learners better understand the technological shifts occurring in American factories. Leyh: The benefits are many. Manufacturers have greater access to the educators, on whom they will increasingly rely to prepare a skilled employee base, and thus gain a stronger voice in making known the qualities and experience needed to run a successful operation. Universities have the opportunity to increase alignment of their curriculum with industry needs, and build stronger relations that result in student employment opportunities and companies leveraging research. We specifically took a cross-functional approach in creating these courses to strike the right balance between academic adequacy and industry relevance, leading to better service for learners and manufacturing companies. quickens, the wait-and-see approach to implementation isn’t enough. New technologies need to be adopted as swiftly as possible. From the moment they leave the research phases of development to the day they go live on a manufacturing floor or line environment, that time is the edge. The relationship between business and academia is interdependent. As new challenges arise in manufacturing, the opportunity for innovation is generated if the right resources are present. In a more interconnected world we see that the obstacles a business confronts are often faced by many others. Factories are at the very front line: they know what they need in terms of technological development, implementation, and what the demands of their workforce's skill set will be. At the end of the day the consumer demands innovation. The factory is simply the middle man searching for it. 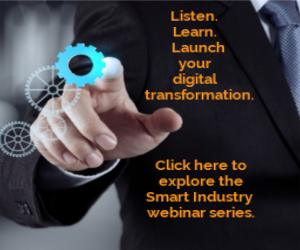 Smart Industry: What part of this program most excites you? McDermott: I’m most excited to hear the impact stories from people who take the courses and get exposed to the incredibly exciting digital manufacturing transformation that many see as changing the nature of human work. This is truly a first-of-its kind series on digital manufacturing and we are arming the workforce with the tools to compete in a fast-paced future. Leyh: This is an exciting time for manufacturing, and we’re thrilled to assist in bringing innovations to the forefront so that people living anywhere in the world—who have a computer and internet connection—can learn about the vast opportunities in digital manufacturing. We recognize the magnitude of being part of this pioneering initiative to create the first DM&D-intensive curriculum, which is one more springboard for supporting America’s manufacturing resurgence. Fornasiero: Establishing a greater understanding of the changes underway in manufacturing and how to leverage them is daunting for most businesses and leaders. This program is broken up into manageable sections with a macro overview progressing into greater detail. This approach makes it easier to learn as much as possible while still being able to focus on what is most relevant to my needs, and how I can share knowledge with my business partners. The Fourth Manufacturing Revolution is here right now. The companies and leadership that choose to embrace it and maximize their use of automation and digital technologies will be writing history; those that fail to get on board now will quickly lose their competitiveness in the global economy. Learn more about the Digital Manufacturing & Design course here.